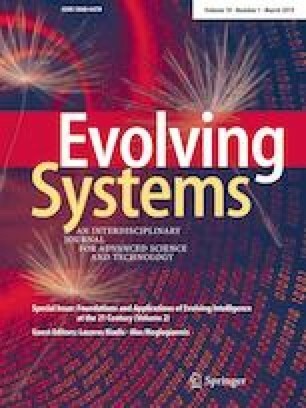 Editorial for the 2nd volume of the “Foundations and Applications of Evolving Intelligence at the 21st century” as a Special Issue of the Evolving Systems (EVOS) Springer Journal. Totally, 6 (six) papers were accepted for publication in this Special Issue, after passing through a peer review process by independent academic referees. The papers presented herein, introduce innovative evolving algorithmic approaches developed to address real world modelling problems, of classification, control and prediction, applying certain level of novelty. The 1st paper is entitled: “Heuristic and metaheuristic solutions of pickup and delivery problem for selfdriving taxi routing” and it is authored by Viacheslav Shalamov, Andrey Filchenkov and Anatoly Shalyto, from the Computer Technologies Lab of the ITMO University, St. Petersburg, Russia. The authors propose a strategy-based hybrid framework for the case of self-driving cars and more specifically for the taxi routing Pickup and Delivery problem. They employ the standard small-moves technique in order to achieve routing optimization. Their approach has been successfully tested on real world datasets from UK. The 2nd Paper “Applying nature-inspired optimization algorithms for selecting important timestamps to reduce time series dimensionality” is written by Muhammad Marwan Muhammad Fuad from the Coventry University, England, UK. This interesting and novel research presents a new algorithmic scheme that projects a time series in a lower-dimensional space by selecting its important points. It is interesting that these points are chosen by an optimization process and not according to a geometric criterion, which has a certain level of subjectivity. The important points are selected on a dataset-level and not on a single time series-level. This methodology enables the application of the popular GEMINI algorithm with promising results. The title of the 3rd paper by Theodoros Iliou, Georgia Konstantopoulou, Mandani Ntekouli, Christina Lymperopoulou, Konstantinos Assimakopoulos, Dimitrios Galiatsatos and George Anastassopoulos from the Democritus University of Trace Greece, from the Special Office for Health Consulting Services Greece and from University of Patras, Greece, is the following: “Machine learning preprocessing method for depression type prediction”. The main objective of this research is the introduction of a novel preprocessing approach to enhance the efficiency of the Machine Learning methods for the cases of patients with mental problems. The results of the testing have proven the validity of the introduced approach. Konstantinos Arvanitakis, Ioannis Karydis, Katia L. Kermanidis, Markos Avlonitis, from the Ionian University Greece, are presenting the 4th paper entitled: “A machine learning approach for asperities’ location identification”. This modeling effort introduces a Machine Learning approach to locate areas with high probability of asperity existence. The employed feature vector information is extracted solely by earthquake catalogs. This significant research effort can have a potential impact in the spatiotemporal analysis of an area’s seismicity. The 5th paper is entitled: “Hybrid local boosting utilizing unlabeled data in classification tasks”. The authors are Christos K. Aridas, Sotiris B. Kotsiantis, Michael N. Vrahatis, from the University of Patras, Greece. The authors introduce an improved version of the local boosting of weak classifiers. The proposed approach includes prototype selection. The aim is the reduction of the time required for the prediction of an unseen instance and the increase of the accuracy in the local presence of noise. Testing on several real-world datasets, has proven the superior performance of the novel introduced algorithm. The 6th and last paper “Multi‑label active learning: key issues and a novel query strategy” is authored by Everton Alvares Cherman, Yannis Papanikolaou, and Grigorios Tsoumakas and Maria Carolina Monard, from the University of Sao Paulo, Sao Carlos, SP, Brazil and from the Aristotle University of Thessaloniki. Active learning is a supervised task where the learning algorithms can actively query an oracle (e.g. a human annotator who is familiar with the nature of the problem). The authors discuss the main issues that need to be considered in pool-based multi-label active learning and they discuss to what extend current approaches contribute to the optimization of active learning. We hope that many scientists will find the above contributions very interesting and that they will be motivated in their research efforts. The Guest editors wish to thank all the authors and reviewers that contributed to this special issue, and also to the editors-in-chief and the editorial office of the Evolving Systems (Springer) journal for their kind and invaluable support.